Willow Tree Farm really has the best chicken salad we have ever tasted. There are big chunks and smooth shreds of of chicken. There is a slight sweet from brown sugar. The Willow Tree chicken salad is so creamy and so good buttered hot dog rolls and a side of potato chips. We would get it at our deli section and then in the prepared containers. 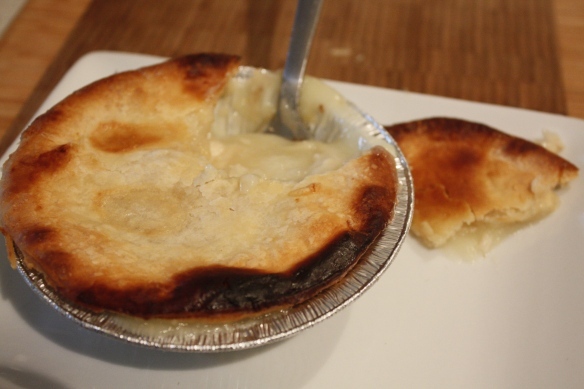 We have made our own chicken pot pie (BMH’s chicken pot pie), but prefer premade ones sometimes when we just do not have the time to make them from scratch. 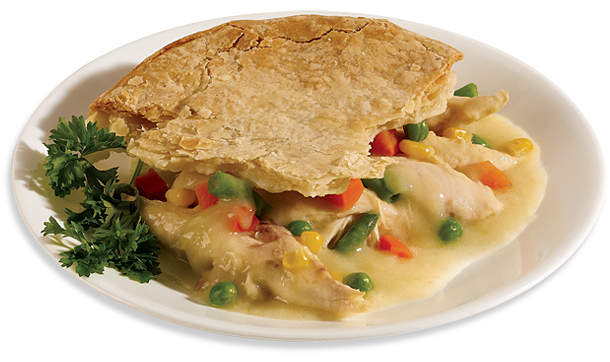 We have tried most of of the pot pie products out at supermarkets including the Trader Joe’s chicken pot pie, Swanson’s microwaveable pot pie and many others including The Savory Plate. Often times the gravy is a bit salty, the crust super thin, the filling having only bits of chicken. So far our favorite has been The Savory Plate. We have yet to try the Willow Tree Chicken and Turkey Pies and finally got the opportunity. We purchased a single serve 8 ounce pie from our local 24 hour Shaws. Although there are several varieties including with vegetables and with bliss potatoes, our store only carries All Meat pies in the small and large sizes. The pies are available in 8 (single serve), 26 (serves 3), & 52 oz. sizes (serves 6), however our local Shaw’s only carried the 8 and 52 ounce sizes. Wish there was the medium sized one, which would be perfect and more flavors. We preheated the oven to 400 degrees, glazed the top of the pie crust with a bit of milk (per the directions to make the crust even more golden) and waited the 40 minutes. The room permeated with a nice chicken pot pie smell. The large chunks of all white breast meat chicken was substantial. We are used to little bits of brown meat and cubes from other brands, but this were large pieces of white breast meat. The homestyle gravy itself was so cozy, but a little salty. We needed a glass of water after enjoying the pot pie. The buttery crust top was by far the best crust and part of the pie. With the first day of school creeping up on us faster than we would like, busy moms everywhere are looking for ways to make their hectic schedules easier. Here are a few ideas to squeeze more time out of your days, while taking your family where they need to be – and keeping them well-fed! As your fall sports stars get into the swing of practice and game schedules, a family dinner becomes more challenging. The great thing about Willow Tree Farm pies is how much you can accomplish while they are cooking in the oven. We’ve heard from Willow Tree Moms who like to use this time to do things like help their kids with homework, do laundry, prepare the next day’s lunches, or catch up on their own email or work that didn’t quite get finished earlier. You’ve heard of cold pizza for breakfast. There are actually Willow Tree fans out there who eat cold chicken pie leftovers for breakfast – but we’re not sure how that will fly with your family. Some families like to round-out their Willow Tree pie with easy-to-make side dishes, like a green salad. Others are content with the pie alone. Or to save even more time, you can buy the pies with the side dishes baked right in, like Willow Tree with Red Bliss Potato or Willow Tree Classic Vegetables varieties. Looking for new ideas for vegetable side dishes? We have a variety of green ones pinned for you right here: Willow Tree Green Side Dishes Pinterest Board. If you are driving distance from Attleboro, MA, you can simply stop by our retail store for a complete menu of prepared lunch and dinner options. Many visitors are amazed to find how far beyond our classic poultry pies and chicken salad that we go. We carry everything from rotisserie chickens (including our popular BBQ chicken) to over 20 different kinds of salads and a fully-stocked deli. 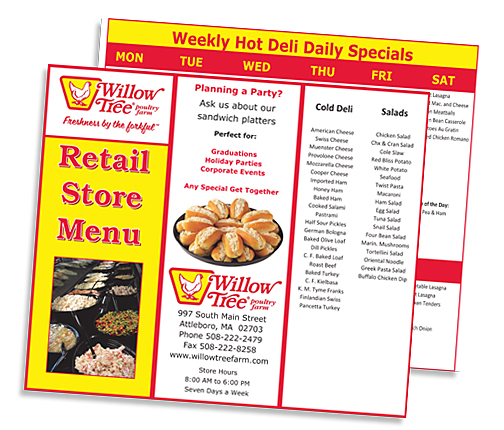 Download a pdf of our menu here, and keep it handy if you’d like to know the daily hot deli specials that you can bring home to your family. We do change our menu, so visit our website for the latest version. And more…not to mention Party Platters if you are hosting a meal for an entire sports team or school club! No Easy Access to Willow Tree Foods? 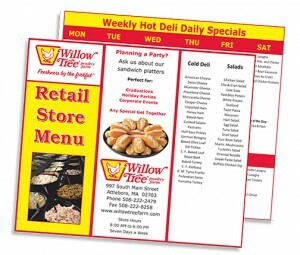 If you live in an area where Willow Tree is not sold, you can order many of our products at our online store. Unfortunately, shipping fees do apply. Good luck to all of you busy families out there. We hope you have a fantastic school year!